Not long ago we revealed our new designs for the website and our brand in general. We’ve gotten great responses from everyone so far and we love the new looks ourselves. If you saw those designs and thought “Those would look dope on a shirt.”, then we think very much a like; that’s what we’re here to announce. These brand new t-shirts on the way are essentially our new team t-shirts but they came out so dope we figured we might as well offer them to everybody. They’re our usual super soft 100% cotton blends, but they’re long body with a long rounded back hem. 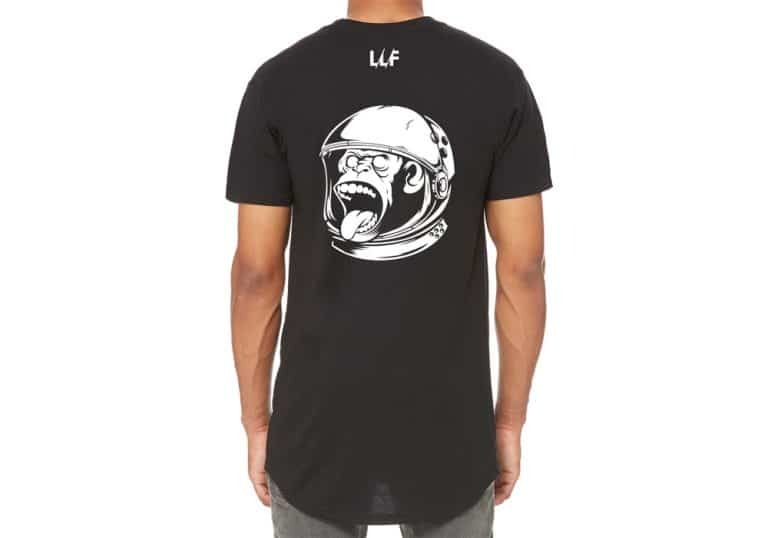 Our full length slanted logo is located on the front of the shirt with the short hand version located underneath the neck on the backside and our newly designed space monkey is printed below that, enlarged. We are now taking preorders for these shirts and expect to sell out fast. The preorder will be running for a week or so from today, until we receive them from our manufacturers. All preorders placed through our shop will receive a complimentary 30% off coupon code for a future purchase through email once the order is completed. These will go fast, so preorder yours now while you still can.